Consistent maiden chaser Talking Tommy appreciated box one when he took out tonight’s Sign Strategy Call Phil Maiden over 405m. Prepared out of Brookton by John Vuletich Talking Tommy began nicely before settling second at the first turn behind pace-maker Sheed’s Goal. Turning for home Tommy zoomed to the front before winning by a length in 23.05. The Michael Johnston trained Sheed’s Goal held second ahead of outsider Accura Girl who is prepared by Simon Lee. It was a deserved break-through for Talking Tommy who had been a minor place-getter at 11 of his previous 20 starts. He is a litter brother to Brookton Bomber (4 wins), Magic Wren (1 win), Midnight Gas (6 wins), Our Sovereign (1 win), Rusty Wren (1 win) and Sir Barwood (3 wins). Race 3 Number 3 PINKIE PIE : Ran on gamely after having no room to zoom in the early and middle stages. Race 4 Number 10 GO GETTEM FANCY : Caught the eye to finish just behind the place-getters after settling well back. Consistent placegetter Sunset Navana prevailed in tonight’s Essential Refrigeration Services Maiden over 490m, overcoming box eight to upset the favourite Nitro Mini. 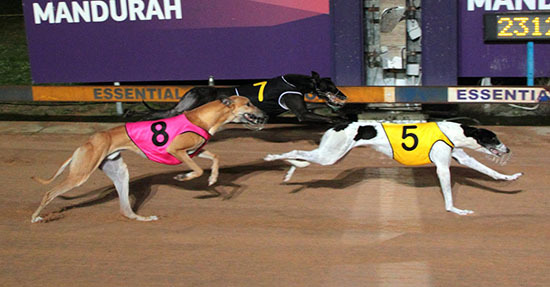 Nitro Mini was sent out at $1.90 for James Jeffries and after beginning well set the speed before being overtaken at the half way mark by Sunset Navana. Sunset Navana had been placed in 14 of her first 26 starts and had earned over $9500 in prize money despite failing to win. 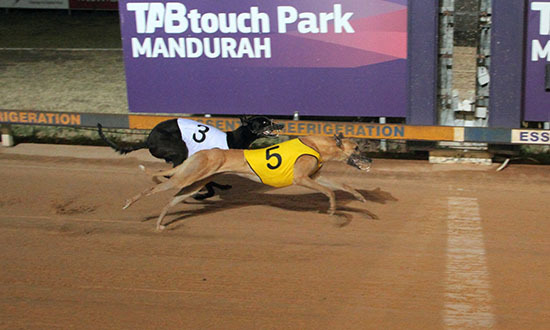 She maintained her lead in the front straight and recorded a handy 27.96, defeating Nitro Mini by a length. Six lengths away third was the Tim Gummow prepared Reflex. Sunset Navana is owned by Che-Ane Toutoungis and is prepared out of Whispering Palms Kennels by David Hobby. Trial 1 Number 5 IT’S A STORM : Rocketed around in 22.64 which will win 99% of maidens over 405m. Race 4 Number 1 BEDELIA WAY : Rocketed late to run third and has now been placed in 13 of 18. 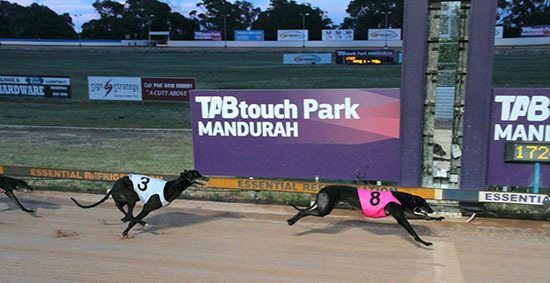 Canning Vale trainer Jamie Marsh brought three greyhounds to the Mandurah track tonight and left with a treble. 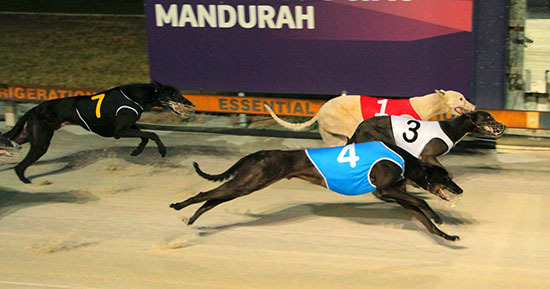 Deberti relished box one in the first event, railing to victory in a swift 22.95. Deberti’s full sister Applejack won the third race in 23.10 after reeling in race favourite Magic Wren. Marsh notched his treble in the fifth race when former Victorian Double Talkin’ led throughout over 490m in a smart 27.78. Both Deberti and Applejack qualified for next Tuesday’s Maiden Final while Double Talkin’ broke through for his first WA victory since arriving from Victoria. Marsh has enjoyed a lot of success in the past with the likes of Cobra Clutch, Natural Sapphire, Royal Freddie, Ferdinand, Hodor, Sissoko, Mini Emily and Archie Doodah. Race 4 Number 2 BROOKTON BOMBER : Won again in a sizzling 22.78 and won’t take long to charge up the grades. 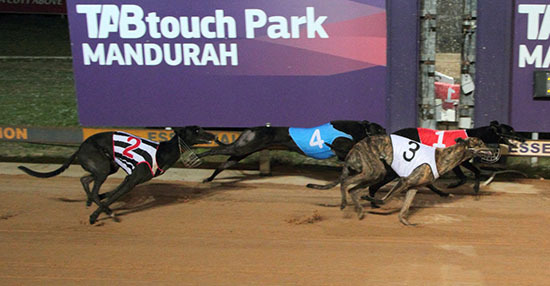 Race 5 Number 5 BUSH BANDICOOT : Showed plenty of mid race acceleration and posted a smart time in finishing third.